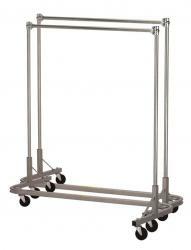 60" STACK-RACK GARMENT RACK 63"L x 22"W x 67"H. 150 lbs Capacity. The unique nesting feature of this rack makes this ideal for solving space restrictions. Heavy gauge steel construction with easy-rolling 4" swivel casters makes it a real workhorse. Base is powder coated in silver. Poles are zinc-galvanize plated. Optional second crossbar can be added for extra capacity.Assembles in minutes.